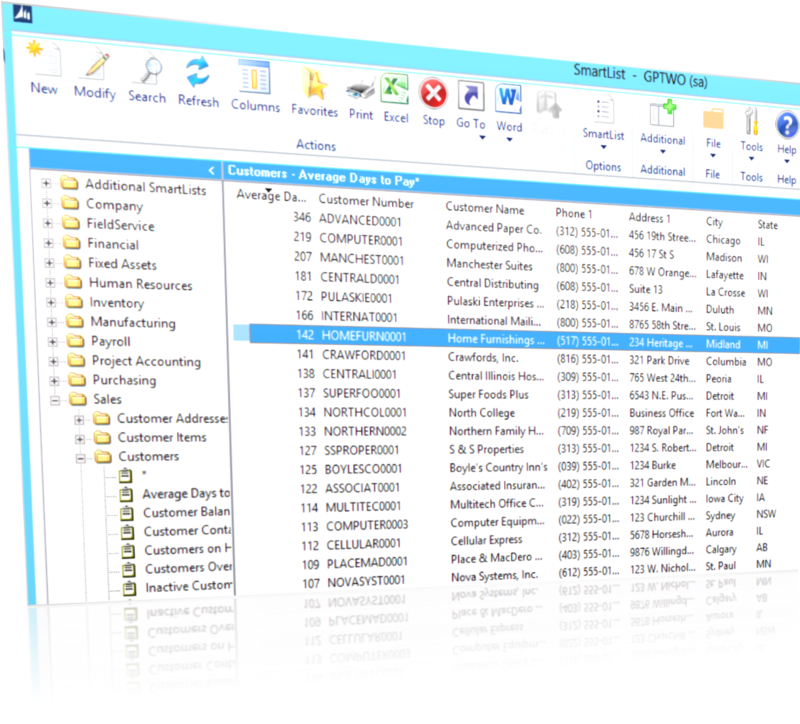 One of the best things about SmartView is that it is available inside of Microsoft Dynamics GP just like SmartList is – and it is also available outside of Microsoft Dynamics GP which means everyone inside your organization can now share in and benefit from easy access to your Microsoft Dynamics GP data. SmartView can be launched from your desktop, saving you money by allowing you to buy fewer licenses of Microsoft Dynamics GP. Since you probably don’t want everyone to see all the data, you can use SmartList Builder, SmartView Favorites and SmartView security to control and configure the SmartView experience. There is a reason you spend so much time collecting data within Microsoft Dynamics GP – and that is so you can find it instantly when you need it and use that data to make your business run day to day. SmartView gives everyone in your organization the exact data each person needs to do their job. The same tool works for the CEO doing an analysis, the project manager reviewing timesheets, the mechanic looking for specs or even the accounts team completing reconciliations. Ways SmartView will make your day better! Speed SmartView provides the solution for anyone that has ever waited impatiently for a SmartList to refresh. For example, if you run the Sales Line item list in SmartList, it would take 2.5 minutes to return 4259 rows. If you use SmartView you get the exact same data returned in 7 seconds! Excel Cut and Paste selected records directly from SmartView to Excel, Word or an email. Full Screen Use every bit of your screen to view our data. No more white spaces! Unlimited Filters There is no limit at all on the number of filters you can have. You can mix and match AND’s and OR’s to get exactly what you are looking for. Single Screen Eliminate up to 7 mouse clicks, by having everything on one screen. Group Group your data by any field, by a simple drag and drop function. It’s like creating your own reports on the fly. Sub Total When you group you will receive auto subtotaling of all you data. So group by customer to see totals by customer. Sort Sort how you please, even by a number of columns simultaneously. GoTo’s All the goto’s from SmartLists and SmartList Builder are available to make navigation into Microsoft Dynamics GP a breeze. Export Export your lists to PDF, Excel or CSV. SV has been timed at being 10 times faster than a SmartList export. Multiple Instances Open multiple instances of SmartView to let you multi task and look at multiple lists simultaneously. Columns Add, remove and reorder columns by simply dragging and dropping where you’d like them to go. Restrictions Only see the data you need, when you need it. Favorites Create the view you go back to most and save it as a favorite. You can even share that with your team. Searching Searching across all your data or by column.